We recommend checking out our discussion threads on the WD 6TB My Book Thunderbolt Duo WDBUTV0060JSL-NESN, which address similar problems with connecting and setting up Hard Drive Arrays WD. The user manual for the WD 6TB My Book Thunderbolt Duo WDBUTV0060JSL-NESN provides necessary instructions for the proper use of the product Computers & Solutions - Drives & Storage - Hard Drive Arrays. 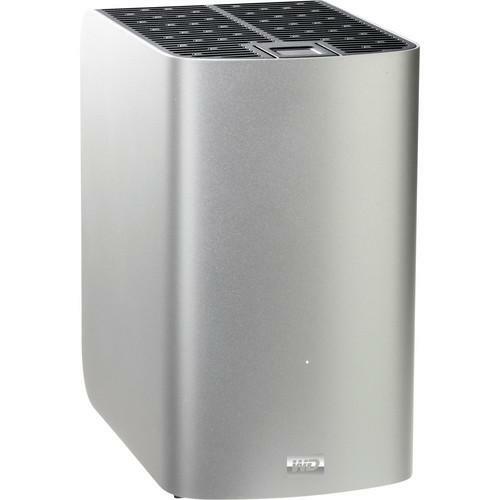 The 6TB My Book Thunderbolt Duo from Western Digital is specifically designed to be compatible with Apple Time Machine and systems running Mac OS X 10.6.8 or higher. This My Book Thunderbolt Duo comes with a 6TB capacity to save a variety of files, from HD video content to movies, photos and more. The enclosure consists of dual removable drive bays, allowing for easy removal of the drives should they need to be swapped out. These drives can be configured in a variety of RAID configurations including RAID 0, RAID 1 and JBOD making it possible to configure this drives for performance or redundancy. The dual Thunderbolt ports found on the back of the enclosure support daisy chaining of up to six devices and data transfer speeds up to 300MB/s. If you own a WD hard drive arrays and have a user manual in electronic form, you can upload it to this website using the link on the right side of the screen. Box Dimensions (LxWxH) 14.0 x 12.0 x 10.0"
The user manual for the WD 6TB My Book Thunderbolt Duo WDBUTV0060JSL-NESN can be downloaded in .pdf format if it did not come with your new hard drive arrays, although the seller is required to supply one. It is also quite common that customers throw out the user manual with the box, or put the CD away somewhere and then can’t find it. That’s why we and other WD users keep a unique electronic library for WD hard drive arrayss, where you can use our link to download the user manual for the WD 6TB My Book Thunderbolt Duo WDBUTV0060JSL-NESN. The user manual lists all of the functions of the WD 6TB My Book Thunderbolt Duo WDBUTV0060JSL-NESN, all the basic and advanced features and tells you how to use the hard drive arrays. The manual also provides troubleshooting for common problems. Even greater detail is provided by the service manual, which is not typically shipped with the product, but which can often be downloaded from WD service. If you want to help expand our database, you can upload a link to this website to download a user manual or service manual, ideally in .pdf format. These pages are created by you – users of the WD 6TB My Book Thunderbolt Duo WDBUTV0060JSL-NESN. User manuals are also available on the WD website under Computers & Solutions - Drives & Storage - Hard Drive Arrays.